Many people report that it helps alleviate pain and stress. The inversion stretch station lets you invert to multiple angles, which helps to put your spine into traction and decompression. It helps you stretch and rejuvenate muscles, rounding out your exercise routine. This multi-benefit machine uses the same method many hospitals and doctors use to reduce pressure on spinal columns and increase blood circulation. alleviate pain and stress. The inversion stretch station lets you invert to multiple angles, which helps to put your spine into traction and decompression. It helps you strectch and rejuvenate muscle, rounding out your exercise routine. Enter the world of Inversion therapy. With the touch of a button, invert up to a 70 degree angle EFFORTLESSLY! Gently decompress the spine and increase circulation. The Electronic Inversion System was designed to help you relieve back pain and stress. Automatically control the angle and time you invert. Experts agree that simply stretching and decompressing the spine can help to relieve even the most chronic back pain. • SPACEMATE design allows for convenient an easy storage. • Heavy-duty steel frame construction. 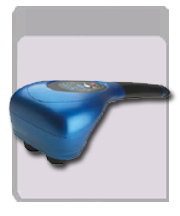 • INTOUCH™ multiple function electronic monitor. • 13" x 42" walking surface. • Wheels allow for easy movement. 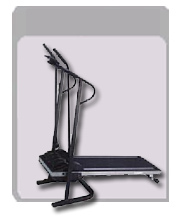 The Cushioned Deck Air Resistance Treadmill provides you with the cardiovascular benefits of walking or jogging, while protecting you from the harmful impact that you get from other treadmills. The key is the cushioned deck, which provides an additional impact-absorbing layer between your feet and the walking surface with every step. Walking or jogging on a treadmill is one of the most effective and convenient ways to burn calories. So why not do it in comfort. 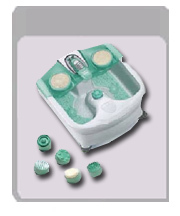 • Independent design step ping action provides a smoother, more comfortable motion. • InMotion™ design folds, without the use of locking pins or adjustment knobs, allowing for easy storage. 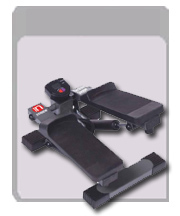 • Foam grips and oversized slide resistance pedals for added comfort and stability. 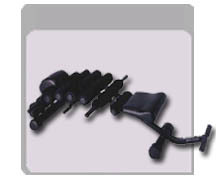 • Non-slip frame end caps. • Extended assist hand grips. • Stitched contoured durable vinyl covered bench. Position 1: An upright bench with dumbell storage. 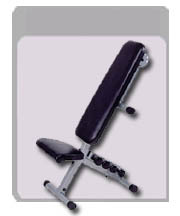 Position 2: A flat bench that allows the user to perform a number of dumbell exercises. 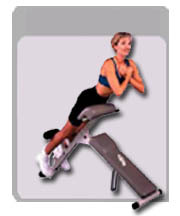 Position 3: Adjustable incline slant board provides a great abdominal workout. for beginning your Full Circuit Workout. • Workout Video details more than 20 exercises. • Easy To Change Resistance with Quick Snap The Band Flex Gym was designed to give you a convenient and efficient full body workout. 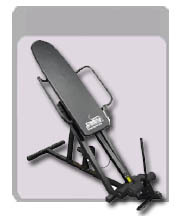 It can be used for both strength and cardiovascular training. 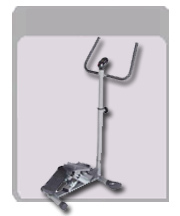 It comes complete with a lat tower and a leg curl/extension unit. There is even a preacher curl bar attachment. 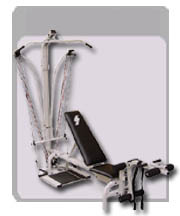 You can perform a wide variety of shoulder and bench presses by moving the adjustable position bench. 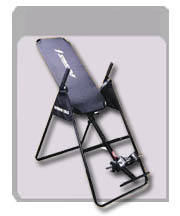 The Band Flex Gym has a sliding seat for rowing and leg press exercises. The resistance cords provide an adequate and safe way to perform resistance exercises without a spotter. Finally, with a footprint of only 21.5" X 27.5" it can be stored unobtrusively in the corner of any room when not in use. 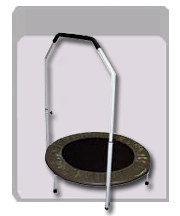 The spring resistance In Place Trampoline allows healthy, progressive exercise in the comfort of the home, office or gym. Utilizing body weight, gravity, thrust and inertia, this form of exercising modifies your body weight and takes the body through periods of weightlessness. By adding dumbbells or weights to your routine you can progress to a more complete cardiovascular workout. 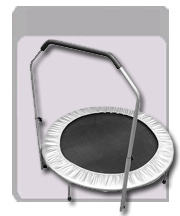 The spring resistance folding Trampoline allows healthy, progressive exercise in the comfort of the home, office or gym. Utilizing body weight, gravity, thrust and inertia, this form of exercising modifies your body weight and takes the body through periods of weightlessness. By adding dumbbells or weights to your routine you can progress to a more complete cardiovascular workout. 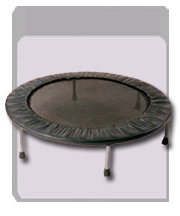 The Body Shaper Trampoline allows healthy, progressive exercise in the comfort of the home, office or gym. Utilizing body weight, gravity, thrust and inertia, this form of exercising modifies your body weight and takes the body through periods of weightlessness. By adding dumbbells or weights to your routine you can progress to a more complete cardiovascular workout. Stair climbing continues to be one of the most well known and beneficial exercises. Because stair climbing exercises and tones the largest muscles in the body including the buttocks, hips and thighs, it is a great fat burning workout. The movement also provides cardiovascular benefits. 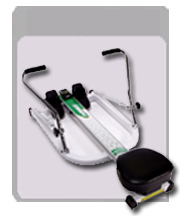 The Deluxe Folding Stepper provides independent stepping action and shock resistance. A timer helps to monitor workout length, and the patented folding action makes storage easy. Work your upper and lower abs, increase flexibility, and strengthen your back and abdominals safely and efficiently for superior results. The AB Hyper Bench, is engineered for heavy-duty performance and safety. Target your lower-back muscles with standing hyper-extension exercises. 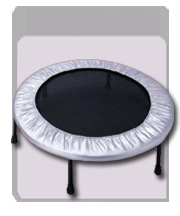 The Ultimate Body Shaper Trampoline allows healthy, progressive exercise in the comfort of the home, office or gym. Utilizing body weight, gravity, thrust and inertia, this form of exercising modifies your body weight and takes the body through periods of weightlessness. By adding dumbbells or weights to your routine you can progress to a more complete cardiovascular workout. • SPACEMATE design allows for convenient and easy storage. 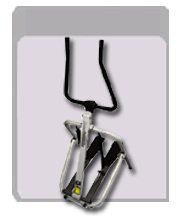 • Easy-to-use adjustable resistance allows you to increase workout intensity. • Plush, cushioned seat for greater comfort. • INTOUCH multiple function electronic monitor. 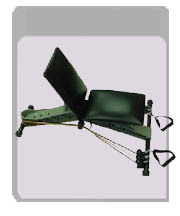 • Adjustable seat arm slides to fit various users’ heights. • Heavy-duty steel frame construction. Foam grips and oversized slide resistant foot pads. 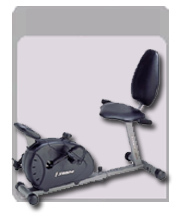 Sit back and get a low-impact workout on the Magnetic Resistance Recumbent Bike. 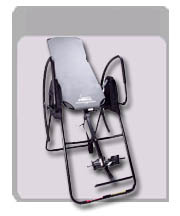 Its design allows for easy mounting and dismounting, while putting you in a semi-reclined position.